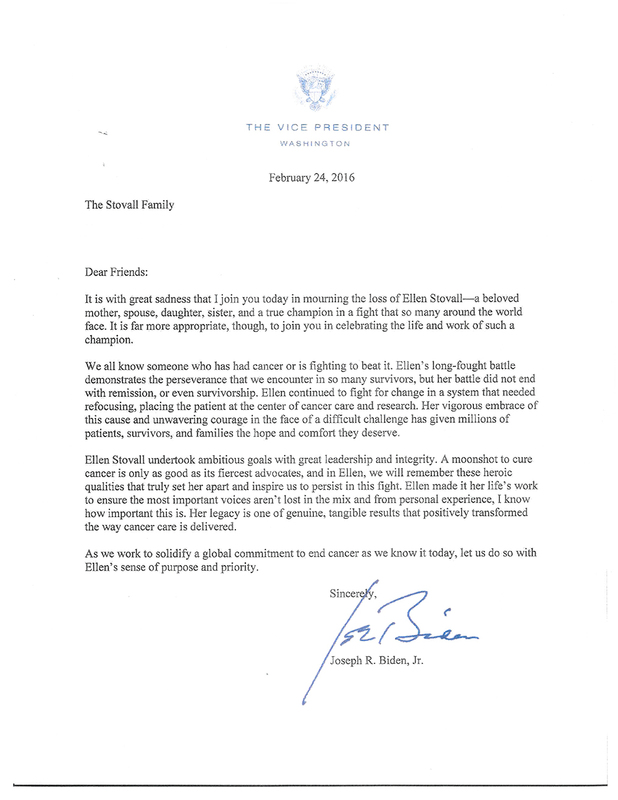 At yesterday’s moving tribute to Ellen Stovall, the following letter from Vice President Joe Biden was read to those in attendance. We wanted to be sure to share it with all of you. It is with great sadness that I join you today in mourning the loss of Ellen Stovall—a beloved mother, spouse, daughter, sister, and a true champion in a fight that so many around the world face. It is far more appropriate, though, to join you in celebrating the life and work of such a champion. We all know someone who has had cancer or is fighting to beat it. Ellen’s long-fought battle demonstrates the perseverance that we encounter in so many survivors, but her battle did not end with remission, or even survivorship. Ellen continued to fight for change in a system that needed refocusing, placing the patient at the center of cancer care and research. 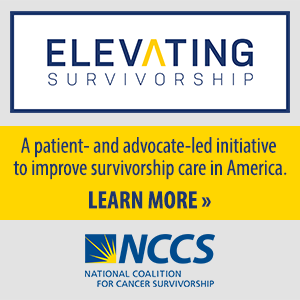 Her vigorous embrace of this cause and unwavering courage in the face of a difficult challenge has given millions of patients, survivors, and families the hope and comfort they deserve. Ellen Stovall undertook ambitious goals with great leadership and integrity. A moonshot to cure cancer is only as good as its fiercest advocates, and in Ellen, we will remember these heroic qualities that truly set her apart and inspire us to persist in this fight. Ellen made it her life’s work to ensure the most important voices aren’t lost in the mix and from personal experience, I know how important that is. Her legacy is one of genuine, tangible results that positively transformed the way cancer care is delivered. As we work to solidify a global commitment to end cancer as we know it today, let us do so with Ellen’s sense of purpose and priority. One Response to "Vice President Joe Biden’s Tribute to Ellen Stovall’s Legacy"
Thank you for the email that brought this Bill to my attention! I am a 4th stage squamous cell carcenoma patient. At this point there is no cure but I’ll be on a maintenance plan soon. I have to say that if I hadn’t been so pushy, I’d be out there just scared to death not knowing much of anything.